'Zero frame' construction provides elegant aesthetics as well as seamless visuals when using multiple monitors simultaneously, including video walls. Full 1080p HD resolution IPS panels provide consistent and accurate color performance from wide viewing angles up to 178 degrees. HDMI input transfers both audio and visual via just one cable, which means less clutter. Tilt capability from -5 to 15-degrees enables users to adjust the displays for the most comfortable fit. Acer America is now offering its H6 Series LED-backlit displays to consumers in the United States. Svelte and savvy, the new monitors feature near zero frame construction for elegant aesthetics as well as seamless visuals when using multiple monitors simultaneously, including video walls. Acer's newest monitors are available in two sizes -- 21.5-inch (H226HQL) and 23-inch (H236HL). Both models have Full 1080p HD IPS panels, which provide consistent and accurate color performance from wide viewing angles up to 178 degrees. They can also tilt from -5 to 15-degrees, so users can adjust them for the most comfortable fit. "Our new Acer H Series displays are the ideal all-around monitors due to their flexibility, Full HD resolution and excellent viewing angles," said Chris White, senior director of product marketing for Acer America. "They offer users the ability to display content with viewing angles as wide as 178 degrees, which makes them ideal for collaborating with others. Plus, the near zero frame construction is perfect for use in multi-monitor setups and video walls." Featuring a 'zero frame' construction, the H6 Series displays sport a very thin .08-inch frame versus the thicker ones typically seen on displays. This clever design provides seamless visuals when building video walls consisting of multiple monitors placed side-by-side and/or on top of each other. A stylish brushed hairline finish has aesthetic appeal and a magnetic surface allows users to post notes and store paper clips directly on the stand. A crisp 100,000,000:1 contrast ratio provides a very high level of clarity and a fast 5ms response time contributes to sharp images even during game play. The Acer eColor Management tool lets users optimize image performance under different viewing scenarios. The new displays also come with built-in speakers and multiple digital connectivity options, including HDMI®, DVI and VGA. The new Acer H6 Series displays are now available at leading retailers in the U.S. 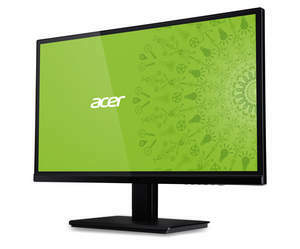 The manufacturer's suggested retail price (MSRP) for the 21.5-inch Acer H226HQL display is $149.99 and the MSRP for the 23-inch Acer H236HL display is $179.99. Like all Acer displays, the Acer H6 Series feature a standard three-year warranty(1) and will be available at leading retailers in the U.S. Established in 1976, Acer is an information and communication technology company dedicated to the research, design, marketing, sale and support of innovative products that enhance people's lives. Acer's green supply chain delivers environmentally friendly PCs, displays, projectors, servers, tablets and smartphones -- tools our customers need to explore beyond limits and experience more. Ranked No. 2 for notebooks globally(2), Acer employs 8,000 people, and 2011 revenues reached US$15.7 billion. Please visit www.acer.com for more information. © 2013 Acer Inc. All rights reserved. Acer and the Acer logo are registered trademarks of Acer Inc. Other trademarks, registered trademarks, and/or service marks, indicated or otherwise, are the property of their respective owners. Prices listed are manufacturer suggested retail prices and may vary by location. Applicable sales tax extra. 1) Limited warranty agreement applies. For a copy, write to Acer Customer Service, P.O. Box 6137, Temple, TX 76503. Svelte and savvy, the Acer H6 Series monitors feature near zero frame construction for elegant aesthetics as well as seamless visuals when using multiple monitors simultaneously, including video walls.